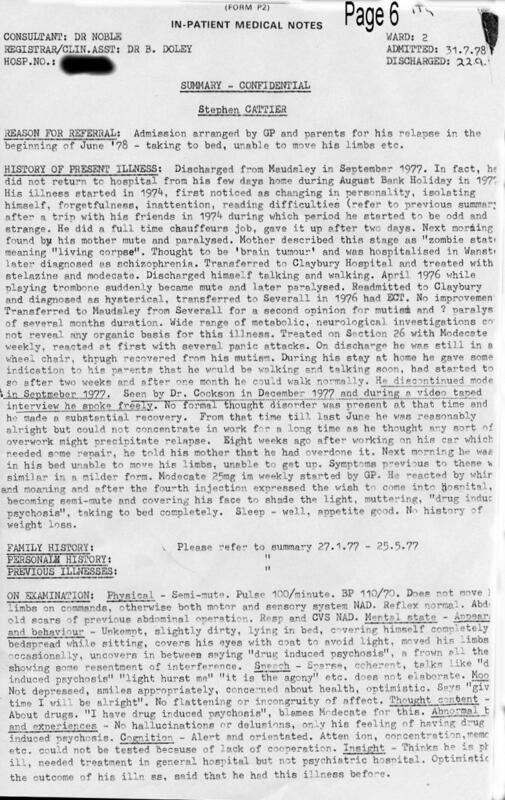 Doctors reports Maudsley Hospital 1977-78. Seven pages. 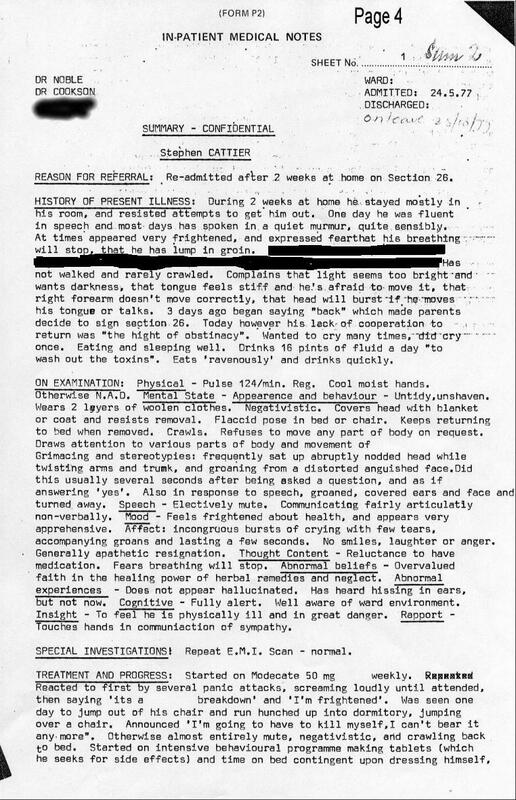 Stephen's corrections and explanations to the reports. The late Dr. Ibiapuye Martyns-Yellowe, a Senator of The Nigeria Congress, Dr. John Coockson, Dr. Peter Noble and Dr. B. Doley. Seven pages. Some details are incorrect i.e. Page 1: The exaggerated knee jerk reflex was a symptom of the neurological injury in question but it was not picked up on unfortunately. I was admitted with weak ones but they improved to strong over the following days when I was naturally improving slightly from the relapse of the illness that happened at the beginning of January 1977 in Severalls Hospital, Colchester, that had been caused by thinking I recollect (it overused the damaged nerves of my mind), and it made me among other things unable to walk for ten months. Dr. Martyns-Yellowe asked a turban wearing colleague of his to check the weak knee reflexes. He shook his head as if to say they were no good. They saw how useless my legs were when I got from the bed onto the floor. However, I could use them in one second bursts (but not to walk) enabling me to get back into bed whilst they were out of the room. On re-entering the room Dr. Martyns-Yellow was amazed that I had got into bed on my own and told me in a shocked, annoyed or indignant loud voice, "How did you get up off the floor? I thought you said you could not move your legs. [and then he added something like...] You can't do this to us, not the Maudsley!" i.e. accusing me of charlatanism. I was soon afterwards put in the day room of Villa ward for observation. In the 1980s my consultant psychiatrist, Dr. P. Noble told me that Dr. Martyns-Yellowe in 1977 believed my condition to be organic meaning he had later changed his mind. 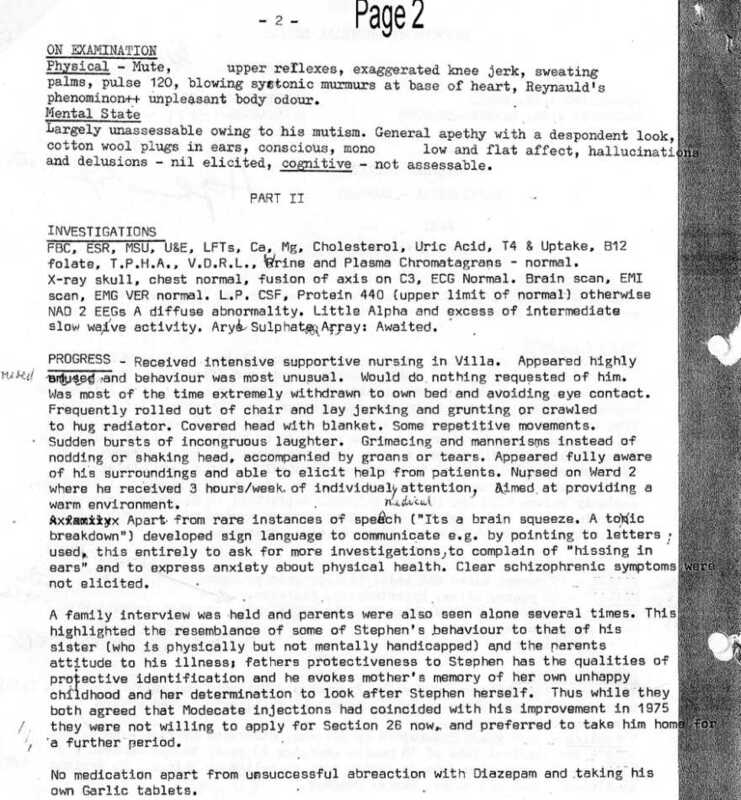 The USA medical student there, one Lisa Shulman, also believed it to be organic according to Dr. Noble. Dr. Martyns-Yellowe actually gave me a lumbar puncture test and he noticed how my back muscles could only work for a few seconds whilst reacting to the needle entering the spine in that they suddenly lost their strength - a symptom of the neurological injury in question where the nerves run out of fuel. A tranquiliser that I was injected with for the procedure accentuated the effect. I never had tranquilisers until I was prescribed Limbitrol 5 for ten days in 1975 which temporarily paralysed me owing to it reacting with the neurological injury to my mind's nerves. My mother was not diabetic. My one day chauffeuring employment at International Stores, Aldgate, London, was about two to three three weeks prior to the exhaustion breakdown in December 1974 and not the day before as reported - I gave it up because I could not concentrate properly enough to drive safely (I worked full-time for ten months in 1974 - see CV in Chapter 1). I was employed with a different firm for the final week in December 1974 making fur coats in Hackney. Some jobs not mentioned. I did exams at school i.e. RSA, CSE but not O or A levels. Became a baptised Jehovah's Witness aged seventeen - not nineteen. Was brought up in the faith by mother from about 1958. I suffered the nervous exhaustion event (final straw to break the camel's back) over a woman after a case of love at first sight in mid 1974 when my mental and religious problems prevented me courting her which was traumatising. I had to give her up after taking her out once - intending the interval to be temporary - in order to feel better. Was December 1962, not 1963, that I fell upon my back from about three feet height in the school Gym but it produced no noticeable injury though. However, it occurred three days before the ulcerative colitis first started. Coincidence? My friends described me perfectly. During the special case conference, Dr. Maxwell, a mind doctor from my home town, said to all there that I had told him Limbitrol had damaged me (I hasten to add that Limbitrol was not faulty but it was given for a contra-indicated condition which was sufficiently weakened nerves). I acted like a silly fool smiling and blocking my ears, and lied when I shook my head to the question what was a pen used for. Alien body syndrome was responsible for that I am afraid to put them off. He should have asked again and then I would have complied pulling out from my pocket the alphabet I used to communicate with pointing to letters to show the pen was for writing. 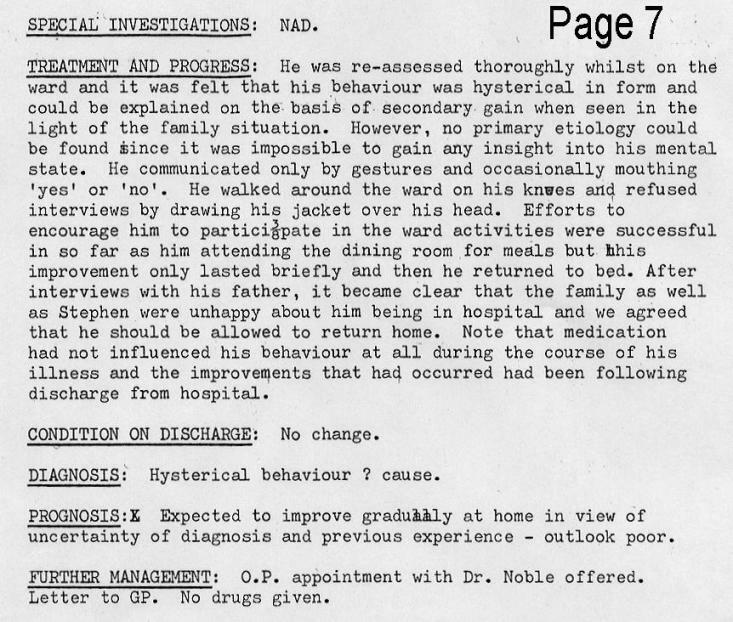 Page 4: 'Back' meant I wanted to return to Hospital to get the neurological injury diagnosed as I was not improving. This is because the nerve damage had been made too bad by then by the accumulative effect of the previous number of relapses for it to happen much again at all naturally in future. When I said to the doctor leave me alone i.e. neglect he says, it was that I thought rest would improve the injured nerves but it did not. Up to 1976 I had always improved naturally up to the same level of wellness that I reached after leaving off Modecate and procyclidine (Kemadrin) in September 1977 and up to June 1978 - I could go out and about walking on my own. The reason for leaving trouser zip undone was forgetfulness owing to a mostly paralysed mind. Hissing in ears was tinnitus, always there from childhood, and it becomes louder whenever I am exposed to the cold since I first became sensitive to coldness in January 1977 from the neurological injury. Page 4: Adrenalin made me able to safely jump over the chair (without the effort causing a relapse) to get away from speech that was hurting my ears. I had to prevent listening further on that occasion otherwise a relapse would have resulted. I do not recall running into the dormitory at the same time though. I was still sensitive to outdoors intensity light up to Autumn 1977. In December I did a one hundred and fifty mile round trip alone by train to the Maudsley, London, walking and talking normally, for a confab with Dr. Coockson who did a video of it. However, I was still suffering from the mental illness caused by the three months of Modecate which must have influenced my explanation of the neurological injury if I even mentioned it as I cannot remember now although I recall the interview. 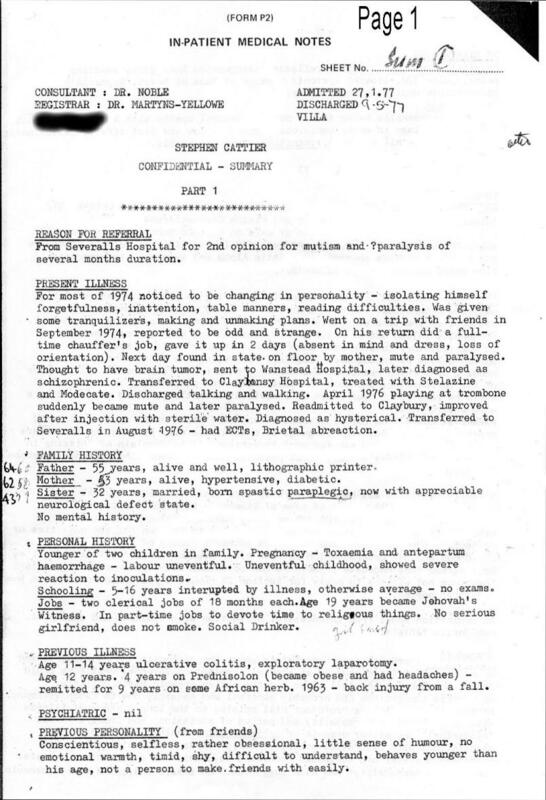 Even by June 1978 the mental illness engendered by Modecate had still not worn off to make me realise I should ask for a second opinion to prove the illness. At least one nurse saw the video afterwards because on a later admission he brought it up. Page 6: Limbitrol 5 in January 1975 and not Modecate was responsible for the illness plus the previous nervous exhaustion. Between mid 1975 until late 1977 I inadvertently proclaimed my illness to be a toxic breakdown, but from then on a drug-induced psychosis 1977 to 1981. Two doctors had told me those terms after I described my condition to them. They had misunderstood me so I got the name of the condition wrong for some years. 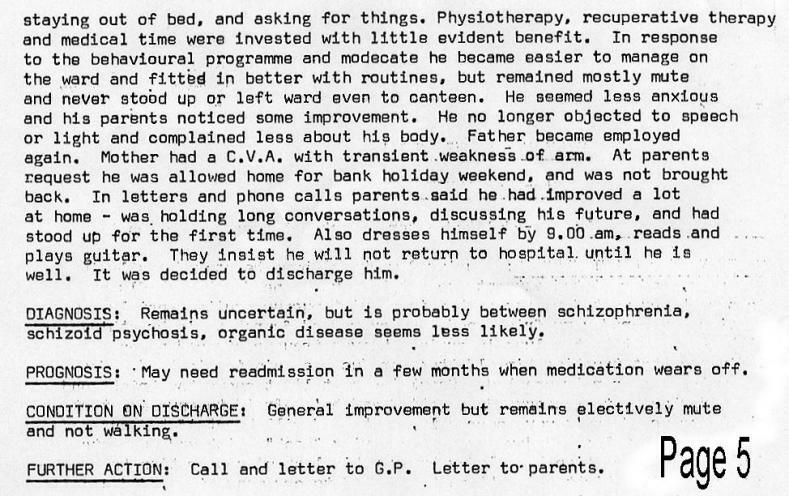 I naturally improved to walking in Severalls 1976 for a while; doctor's report incorrectly says there was no improvement. I had to wear a blind-fold for one to two months up to the end of December 1974 owing to light hurting my eyes after I was exposed to outside light intensity for ten minutes and it caused a relapse - it overused the damaged nerves. The screaming I sometimes did on Modecate in 1977 was owing to an awful fearful feeling the drug produced as a unique side-effect upon the neurological injury, but procyclidine (Kemadrin) would keep it at bay whenever I could get it. To try and make me talk the nurses would withhold Kemadrin if I had not verbally asked for it quickly enough and I could scream in agony afterwards until next pill time. Bizarrely, I could hardly speak and yet could scream for a long time from distress without it causing a relapse. The missing word in above photocopy, third line up from the bottom is, "Thinks he is physically ill..."